The Volusia Building Industry Association is the largest most visible proactive trade organization in Volusia County providing for the economic well being of the construction and home building industry. We are the voice of the building industry. We provide the services that strengthen the industry. The association serves it members and the community through the employment of knowledgeable and professional staff housed in a modern efficient facility using state of the art technology. 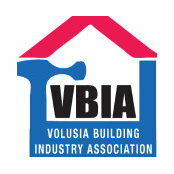 Mission Statement The Volusia Building Industry Association (VBIA) is a not-for- profit professional trade association providing proactive leadership when representing, promoting, and protecting the construction industry. We strive to monitor and influence governmental activities that affect the industry, to provide educational and marketing opportunities for member firms, and to encourage member professionalism.